This indoor holder, magazine dispenser is rust-resistant! 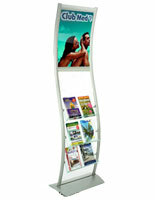 The store fixture, magazine dispenser is comprised of a 24"w x 36"h graphic area and (3) green-edged, acrylic compartments. 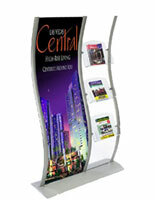 The magazine dispenser, also known as an informational unit, grabs audience's attention with its large poster frame, and leaves a lasting impression with takeaway brochures and pamphlets. Also, included with your unit is a 5-pocket literature divider for optional use. 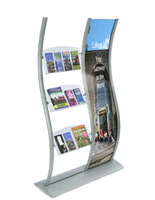 This magazine dispenser is constructed from brushed aluminum and has a sleek, silver finish for additional appeal. The aluminum is great for any high-traffic, indoor environment as it is rust-resistant. 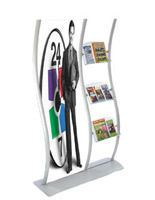 This magazine dispenser merges a literature rack and an image holder into an amazing promotional unit. 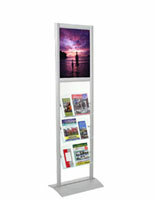 The free-standing unit, magazine dispenser features adjustable brackets to change the height of each pocket. 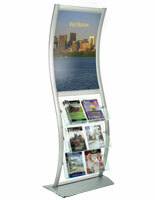 This image holder is also a double-sided magazine dispenser! 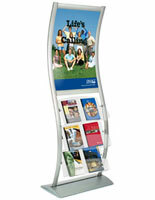 We provide the magazine dispenser with (2) clear, plastic lenses to cover and protect your posters. 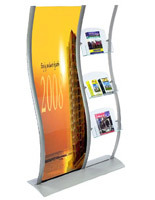 This magazine dispenser, such as our other wave-shaped fixtures, has a unique appearance to draw crowds to your presentation.